“Green acres is the place for me. Farm livin’ is the life for me. The winds of change are blowing full force this week, as all of my planned and unplanned changes begin to take motion. My apartment is filled with boxes, mostly crammed full of books (I heart books, big time.) that are all ready to make the move to Johns Island. I have spent the last few weeks purging stuff out of my life that has become dead weight… VHS tapes, clothes, gifts I never wanted, and things that could be better used by someone else. Once again, I find myself going back to a communal setting, living on an extreme budget, and dedicating my time to working outdoors building. My last service year was spent building homes and now I will spend my time building up farms and the community surrounding them. People keep asking me if I am excited and I keep telling them, not quite yet. The whole process is too surreal for me to truly grasp the changes coming my way. There are still so many changes taking place that it is hard to even forecast what life will be like a week from now. Since my green building job did not accept my proposal to become permanent contractor, I will have to seek out other employment to fill the gaps between the specialty projects I plan to continue doing for them. Although I am disappointed in their decision to not keep me on staff, I think it will probably be the best for everyone, as it will give the affiliate the push it needs to learn to live without having access to me daily while also allowing me to get paid fairly based on my final products and not office hours. My case working job is voluntarily coming to an end but this was inevitable because the nature of the position and the bureaucracy that surrounded it was slowly wearing me down. I will however miss the interesting and candid conversations with my co-workers about parenting, relationships, and race. Not to mention how nice it felt to be constantly thanked for my work and complimented on my efforts… if only it could have been an environmental agency! Looking ahead to the next few days, I will be leaving my case working (sigh of relief), ending a four year process of building a green building program (sigh of disappointment/relief), moving to John’s Island, and becoming a farmer. Change, change, change… I really do love change in its entirely intense, sometimes uncomfortable, but always life sculpting nature. It will be glorious to finally embrace my love of growing things and be able to spend my days doing nothing but learning every aspect of the food production world! Just imagine me breaking out of my office cubicle with pitchfork in hand, leaving behind a trail of paperwork and “while you were out” messages, and diving into a pile of compost while screaming out my xena call in glee. The burden of a car. After having spent almost two years recovering from my last car ownership experience (nightmare) I had no doubt that the transition back was going to be rough. Obviously, when you are buying a used car, the car has been USED. No big shock there. The hope is that the car has been used gently and there are minimal problems with it. Mechanic or not, there is just no way to predict the future of the vehicle, as much as I wish it was possible. So, after taking out a loan and paying the upfront cost of purchasing the actual vehicle (which cost more than I had really hoped to spend). I then had to dive straight into insurance, tags, and taxes. A note on the taxes. Why did I have to pay over $200 in sales tax on a used car? Does that make sense to anyone? Note to self… it does not help anyone to claim the actual price paid. Anyway, these are all expected expenses. So, moving along. As mentioned, I had to buy a battery. Once the battery was purchased, it became clear that I also needed new contacts, so lets throw that in too. Lucky for me, I have mastered the art of “help me I am a female” with “I am not a complete idiot but you are smarter than me”, in order to get my battery installed, old contacts taken off, and new contacts put on (free of charge, obviously). During this changing of the battery, it becomes apparent that my radiator fluid is looking low. Since I just dropped over $100, I saved that for later. Later arrived the following day when my car started acting funny and I discovered that my radiator fluid was now empty. Dan came to the rescue and we filled it up. Easy enough? Well… a week later, my car would not start. Alas, I check the radiator fluid and its empty again. Red flag. I immediately fill it back up and call my mechanic aka James Dean of Charleston (his name is Jerry but I swear he is an older Dean). Co-workers and family are forecasting the worst with scary predictions of head gaskets and new engines. After dropping off the Magic Carpet I feel myself panicking from flash backs of my Altima and the thousands of dollars sunk into that piece of evil machinery. With $250 in my bank account, I was really hoping for a simple fix. Jerry calls me at lunch to tell me that I have a crack in my radiator and that I have to replace it. Simultaneous sigh of relief and distress. I literally do not have the money to pay for it. So what do the adults of my generation do in this situation? Charge it! When I arrive at the shop, Jerry consoles me with kind words and his daughter tries to distract me with funny stories as she swipes my credit card and takes the rest of payment via check. Ugh, being poor is the worst. 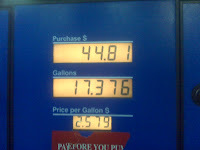 As I am leaving, I realize that my gas tank is empty. Nice touch. At least I still have money left on my credit card. As if the car gods were determined to keep me down, my poor boyfriend cannot get his car to start either. (Am I bad luck?) 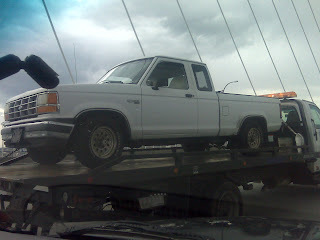 We give it a jump and it seems to be able to make it to a parts store for a new battery and alternator test, so I follow behind him in my newly fixed truck. Alas, this fix was not in the cards. The truck died in Mt. Pleasant on Hwy 17 and luckily for us, some random guy pops out of his truck (trucks unite!) and pushes Dan into the safe have of a collision repair store (how appropriate). The tow truck arrived in record time and scooped up the little truck for a ride to visit Mr. Popular, Jerry the mechanic. I need a personal lobbyist. As referenced in my previous post, I am working hard to convince my green building employer to take me on at a contract rate so that I will not longer have to maintain office hours. This process has been a true test of my patience because I have worked for the affiliate for four years, investing my blood, sweat and tears into the creation of my program. Over the these last four years I have won the organization several awards, absurd amounts of press, over $200,000 in funding, and put them on the map in the “green world”. All of this has been on a part-time basis, with little pay, no benefits, no office computer, and for the first three years, no office space. So… when I have to lobby to be kept on staff for only 30% of the market rate pay and a decrease in my current part-time salary so that I can transition out of the office (where I started in the first place), I find myself a bit unmotivated. Why even try? Well…my program is like my baby and I want to make sure it can survive without me. It has so much potential to grow up and be something I can truly be proud of and I just cannot handle letting it go without a fight. Plus, I love my co-workers and genuinely believe that if given the right tools, Habitat for Humanity could lead the way on transitioning affordable housing to a sustainable product. For example… there is a Net Zero Habitat house in the works with the East Cooper affiliate and if I am able to secure funding, I can hop on board to make it happen! There are so many affiliates out there right now that are already doing great things like Net Zero… I just read about one today about high density Habitat, check it out HERE. I know what some of you are thinking… And NO, I do not want to become a consultant in the for-profit world. My specialty is in the affordable housing world, specifically with Habitat. Having spent the last 7 months working as a Case Worker for families facing eviction and foreclosure, I have had a bitter taste of how UNaffordable housing really is (and how little most people get paid). The reality is that the Habitat for Humanity model provides the highest quality housing ownership possibilities in the $500-$700 a month mortgage price range. These are the homes that we need to be focusing on transitioning to green because they have such a high impact on the homeowners and pose the type of challenge builders need to overcome: keeping green affordable. 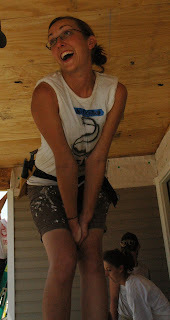 This is a picture of our 2008 Greenbuild Blitz homeowner with her oldest son. So, with high hopes and all of my documents submitted, I await the decision from my Board of Directors. Wish me luck. As I have alluded to in other posts, I am starting a new job on April 1st as a Farming Apprentice. So what does this mean? Well, I honestly am so overwhelmed with work (especially since I am lobbying for Habitat to allow me transition to a consultant position) that I don’t have time to write it up myself, so here is all the information from the website. Goal: to begin growing the next generation of farmers in the Lowcountry. These new community food system leaders and entrepreneurs will use this experience to: improve the health of our community, preserve and steward our land, and strengthen our local food economy. The Partners – LLF, three local experienced farmers, three apprentices, seven area restaurants, and one non-profit working with an underserved population will participate. * Four days a week the apprentices will learn/ practice Sustainable Agriculture techniques on local farms. Rosebank Farm, Fields Farm, Our Local Food. * Monthly classes in agriculture: (Organic Growing School Model). This program is open to old and young farmers in the Lowcountry. * LLF will pay for apprentices to take a business planning class, summer of 2010, and link apprentices with business mentors in our local community. * Apprentices complete a business plan and crop plan for their own farm enterprise for Nov 2010 Graduation. * One day a week apprentices will focus on marketing of farmers produce to restaurants, farm stand/ CSA. * Apprentices will upload pictures of ripe produce weekly online. They will also train their farm instructor. * Chefs will place orders: Glass Onion, Al Di La, Med Bistro, Fish, Monza, Fig, McCradys * Apprentices will deliver to restaurants weekly. * Local farmers increase sales, restaurants increased supply of local food; farmers trained in new system; apprentices practice direct marketing. * Apprentices partner with a local community organization to promote healthy fresh fruits and vegetables. * Apprentices develop direct marketing experience through Farm Stand project, or low income CSA. This is an intensive training and education program and only those dedicated to learning the skill of farming should apply. Conditions are hot and days are long but this is a wonderful opportunity for those with a passion for the land!